I sincerely believe that America has lost its way. In a nation built for a government by the people and for the people, I blame — The People. The U.S. lacks leadership from local to national levels. We lack leaders because The People have abandoned their governing responsibility for decades. When you go to vote, you will most likely see offices running candidates with no opposition. The People blame many things for their apathy, but the fact is, when The People act things change. Failure to practice and grow leadership at the local level has left the U.S. unprepared to solve the nations most basic civic needs, like infrastructure and education. Have Our TV Habits Eroded Civic Engagement? Hillary Clinton supports Israel’s anti-BDS (Boycott, Divestment, Sanctions) efforts in the U.S., which condemn and criminalize citizens and organizations that criticize Israel. In a terror of exclusion and blame, BDS supporters have been sued, arrested, kicked out of school, fired from jobs, and denied access to state contracts. I support BDS, so Clinton’s commitment to aid Israel’s efforts to silence criticism inside the U.S. directly threatens me. Our ‘unconditional’ commitment to Israel causes other foreign policy challenges as well, and I strongly believe that our President should never hold commitments to foreign nations, over the rights and interests of our own nation. In my view, Donald Trump does not have enough of a grasp on the importance of diversity (or human dignity in general) to be the leader that the U.S. sorely needs. The rise of right-wing hate groups against non-white citizens is a huge threat to the stability of our nation. Trump’s rhetoric, which often comes off unhinged and bigoted, is a terrible example, especially for our kids. His example not only encourages other racists at home, and racist leaders across the globe, but further destroys any moral authority that is left in the U.S. In 2015, I made a vow to find and support a leader that I could get behind for the 2016 presidential election. After researching all the independent candidates, I chose Lynn S. Kahn, the “Government Mechanic.” She has experience, she has a plan, and she is inclusive. I have no doubt that Kahn has the skills to transform government to be more effective and responsive to the people’s needs, as that has been her specialty over several decades. But, being the President of the U.S.A. requires less nuts and bolts skills, and more directive leadership. I met Kahn in person in my hometown cafe in June 2016. I let her know that I would support her past the 2016 election. She said she did not plan on organizing past the 2016 election, but was starting to consider it, as several people had pledged enduring support. I still cannot get my head around how someone can plan on running for President without a long-term commitment to build a party, and lead The People. How could someone ask for commitment in such a behemoth process with the intent of leaving them after a few short months? I admire gumption and courage, but Kahn’s vision for a presidential run, as it stood in June 2016, certainly did not meet my needs for a steady leader. For a presidential candidate to win my vote, I expect them to make it onto my state ballot. I offered my time, energy, and experience, to help Kahn get the 22,000 signatures she needed to get on the ballot in Pennsylvania (my home state). We absolutely could have done it with planning and leadership. For reasons I do not know, Kahn did not run a ballot campaign in Pennsylvania. She is also not running a ground campaign, to my knowledge. Without leadership for a sustained movement, a chance of winning, nor organization leadership in my state, I do not consider a 2016 presidential vote for Kahn of value. Nothing fails a leader quite as effectively as blaming others for problems. I recently wrote an article on political exclusion that outlines who/what each of our main political groups blame for our problems. I did not include independents, but they have come to rail against one enemy as well: ‘the two party system.’ I am deeply disappointed that Kahn has patterned this behavior, as I believe Kahn to be intelligent enough to properly identify problems. After all, isn’t that the first step (and most important skill) of being a mechanic? In a response to a questionnaire for IVN, Kahn said that after 2016 she will be dedicated to building an ‘independent political movement,’ and laments the evils of the two-party system for denying the American people more choices. Kahn entered into national politics in 2015 without a long term plan or vision, nor a large scale organizational infrastructure — and expected to win. That pattern is repeated for many independent candidates. A reasoned analysis of the situation cannot ignore the failure of independents to effectively organize, nor the failure of The People to be actively involved in civics. Kahn has mentioned a coalition government several times. I am confounded by this idea on a legal level (the U.S. is a presidential system), and in terms of leadership — how will Kahn provide leadership as part of a coalition of independent candidates? As much as I believe in teamwork and compromise, in the end the President has to have the constitution to make important calls him or herself. I see a lack of leadership here, as Kahn has not provided a message about what exactly is brewing, and seems to be relying on a partnership rather than taking the lead. There are not very many leaders to choose from, and finding an inclusive leader who does not blame ‘the other’ for problems is even harder. Although she threatens my right to speak out against Israeli policies and might not have the guts to change our Middle East policy toward one of peace-building — I believe Clinton can do the most good for the most people. We are a divided nation, and that is more dangerous than any crummy leader. 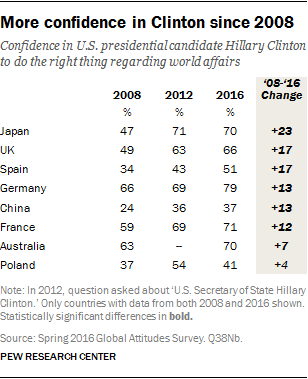 I believe Clinton is best positioned to pull our country together and continue healing our image on the world stage. Clinton is a tempered, inclusive leader. The most compelling evidence has been her ability to pull support from the left and the right. She has spent her life in public service as a directive leader, signaling corrective courses on local to international issues. Clinton has a distinguished public record. World leaders know and respect her. She is respected by the left and the right (though not the extreme factions so much), and she will support most of my interests. Who my country-people are is more important than who my President is. Will they stand up for me if my rights are threatened? Will they treat me equally, and with civility? Will they contribute to the greater good? I am more worried about our culture than our leaders, because the leaders that rise will be a mere reflection of the culture we collectively create. I heard the best advice from Vernon Jordon, on PBS’s History Makers — he said that the secret to making a big impact is to tend your own garden. Start in your own community. Get involved, and build.